“Radical-but-conservative” parenchymal-sparing hepatectomy (PSH) for colorectal liver metastases (Torzilli 2017) is increasing reported. The PSH revolution has two potential advantages: avoiding postoperative hepatic failure (POHF) and increasing the possibility of re-do surgery in the common event of future recurrence. However, early series reported worse long-term survival and higher positive margin rates with a parenchymal-sparing approach, with a debate ensuing about the significance of the latter in an era where energy-devices are more commonly employed in liver transection. No randomised controlled trials exist comparing PSH with major hepatectomy and case series are naturally biased by selection. In this issues of HPB, Lordan and colleagues report a propensity-score matched case-control series of PSH vs. major hepatectomy. The results are striking. 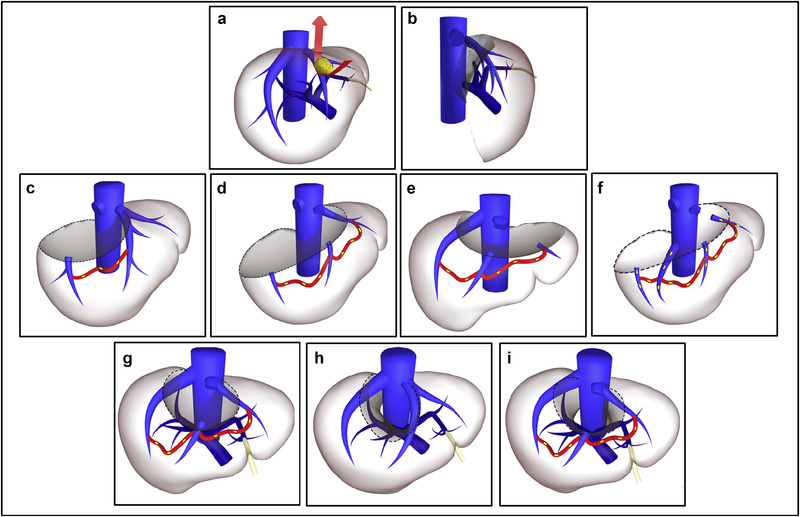 The PSH approach was associated with less blood transfusion (10.1 vs 27.7%), fewer major complications (3.8 vs 9.2%), and lower rates of POHF (0 vs 5.5%). Unusually, perioperative mortality (0.8 vs 3.8%) was also lower in the PSH group and longer-term oncologic and survival outcomes were similar. Results of propensity-matched analyses must always be interpreted with selection bias in mind. Residual confounding always exists: the patients undergoing major hepatectomy almost certainly had undescribed differences from the PSH group and may not have been technically suitable for PSH. Matching did not account for year of surgery, so with PSH becoming more common the generally improved outcomes over time will bias in favour of the parenchymal-sparing approach. Yet putting those concerns aside, there are two salient results. Firstly, PSH promises less POHF and in this series, there was none. Secondly, PSH promises greater opportunity for redo liver surgery. There was 50% liver-only recurrence in both groups. Although not reported by the authors, a greater proportion of PSH patients underwent redo surgery (35/119 (29.4%) vs. 23/130 (17.7%) (p=0.03). Perhaps for some patients, the PSH revolution is delivering some of its promised advantages. Realistic medicine is a useful concept describing healthcare that puts patients at the centre of decision making and treatment, with an aim to reduce harm, waste and unwarranted variation. One of the great challenges in medicine today is supporting patients with incurable disease in their treatment choices. Advising patients on interventions that offer reducing benefits in the face of increasing potential harms, when they may feel obliged to “take all treatments going”, requires honesty, candour and data. Realism is a better term than futility, but they are two sides of the same coin. In HPB, Kim and colleagues examine survival after recurrence of bile duct cancer. The facts of this disease are always sobering: the median survival after diagnosis of recurrence is 7 months. The study is useful in that the authors have sufficient numbers to examine subgroups of those with recurrence to identify which patients may potentially benefit from salvage treatment (which was mostly chemotherapy). For those with poorly differentiated primary tumours, a short time to recurrence, poor performance status and elevated CA19-9, survival was only a handful of months. 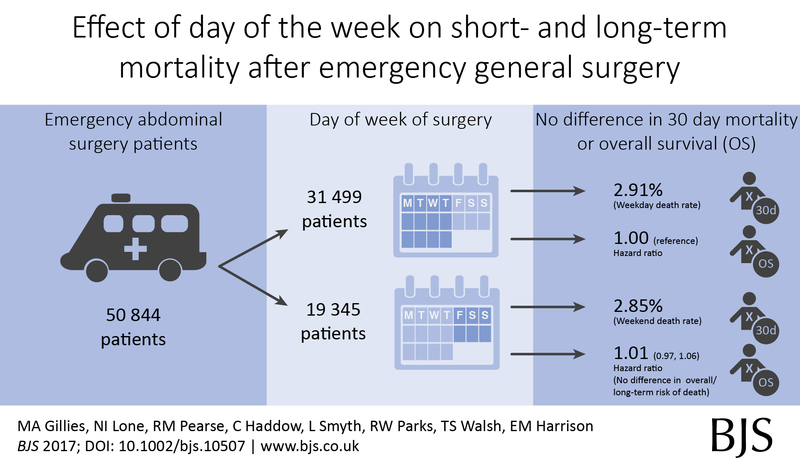 Out latest paper published in the BJS describes short- and long-term outcomes after emergency surgery in Scotland. We looked for a weekend effect and didn’t find one. In around 500,000 emergency and planned surgery patients, we didn’t find an association between day of surgery or day of admission and death rates. 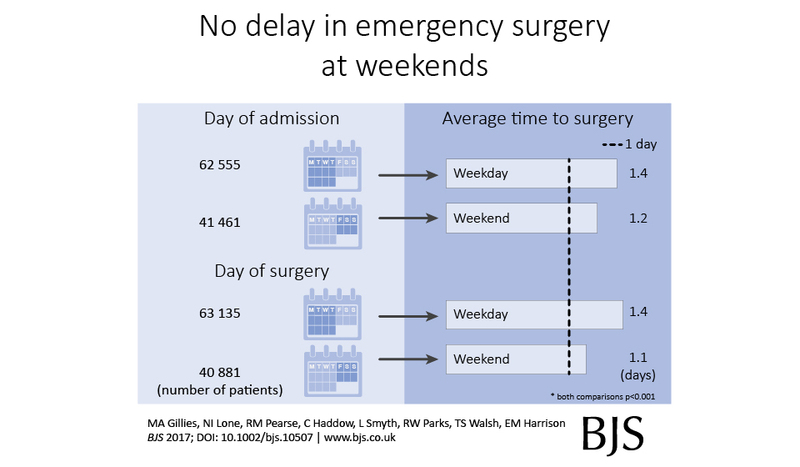 We also found that emergency surgery performed at weekends, or in those admitted at weekends, was performed a little quicker compared with weekdays. Online: BBC NEWS ONLINE, DAILY MAIL, EXPRESS.CO.UK, MIRROR.CO.UK, HERALD SCOTLAND, THE COURIER, WEBMD.BOOTS.COM, NEWS-MEDICAL.NET, NEW KERALA (India), BUSINESS STANDARD, YAHOO NEWS, ABERDEEN EVENING EXPRESS, BT.COM, MEDICAL XPRESS. This is our new analysis of an old topic.In Scotland, individual surgeon outcomes were published as far back as 2006. It wasn’t pursued in Scotland, but has been mandated for surgeons in England since 2013. 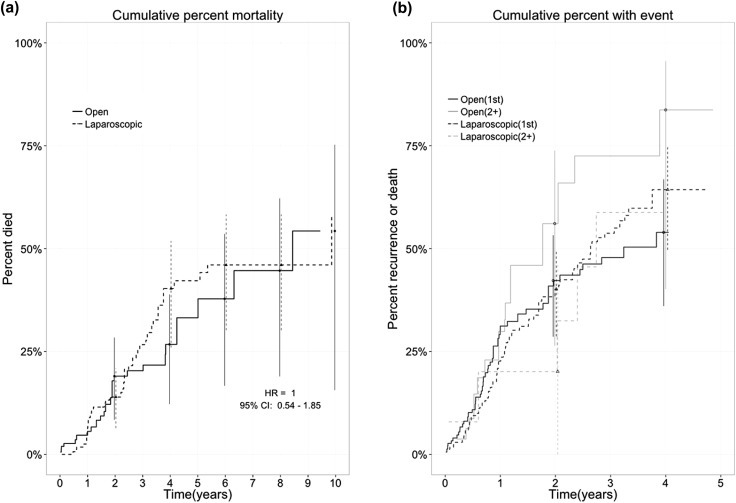 This new analysis took the current mortality data and sought to answer a simple question: how useful is this information in detecting differences in outcome at the individual surgeon level? Well the answer, in short, is not very useful. We looked at mortality after planned bowel and gullet cancer surgery, hip replacement, and thyroid, obesity and aneurysm surgery. Death rates are relatively low after planned surgery which is testament to hard working NHS teams up and down the country. This together with the fact that individual surgeons perform a relatively small proportion of all these procedures means that death rates are not a good way to detect under performance. At the mortality rates reported for thyroid (0.08%) and obesity (0.07%) surgery, it is unlikely a surgeon would perform a sufficient number of procedures in his/her entire career to stand a good chance of detecting a mortality rate 5 times the national average. Surgeon death rates are problematic in more fundamental ways. It is the 21st century and much of surgical care is delivered by teams of surgeons, other doctors, nurses, physiotherapists, pharmacists, dieticians etc. In liver transplantation it is common for one surgeon to choose the donor/recipient pair, for a second surgeon to do the transplant, and for a third surgeon to look after the patient after the operation. Does it make sense to look at the results of individuals? Why not of the team? It is also important to ensure that analyses adequately account for the increased risk faced by some patients undergoing surgery. If my granny has had a heart attack and has a bad chest, I don’t want her to be deprived of much needed surgery because a surgeon is worried that her high risk might impact on the public perception of their competence. As Harry Burns the former Chief Medical Officer of Scotland said, those with the highest mortality rates may be the heroes of the health service, taking on patients with difficult disease that no one else will face. We are only now beginning to understand the results of surgery using measures that are more meaningful to patients. These sometimes get called patient-centred outcome measures. Take a planned hip replacement, the aim of the operation is to remove pain and increase mobility. If after 3 months a patient still has significant pain and can’t get out for the groceries, the operation has not been a success. Thankfully death after planned hip replacement is relatively rare and in any case, might have little to do with the quality of the surgery. Transparency in the results of surgery is paramount and publishing death rates may be a step towards this, even if they may in fact be falsely reassuring. We must use these data as part of a much wider initiative to capture the success and failures of surgery. Only by doing this will we improve the results of surgery and ensure every patient receives the highest quality of care. A low blood count is common with cancer. There are now more studies showing that this can contribute to complications after surgery. Blood transfusion increases blood count but is best avoided in cancer unless the blood count is very low. This new study in the journal HPB shows the effect of anaemia after liver surgery. Here is the editorial highlight I wrote for the journal. Preoperative anaemia is common and affects 30-60% of patients undergoing major elective surgery. In major non-cardiac surgery, anaemia is associated with increased morbidity and mortality, as well as higher blood transfusion rates. The importance of preoperative anaemia in liver resection patients is becoming recognised. 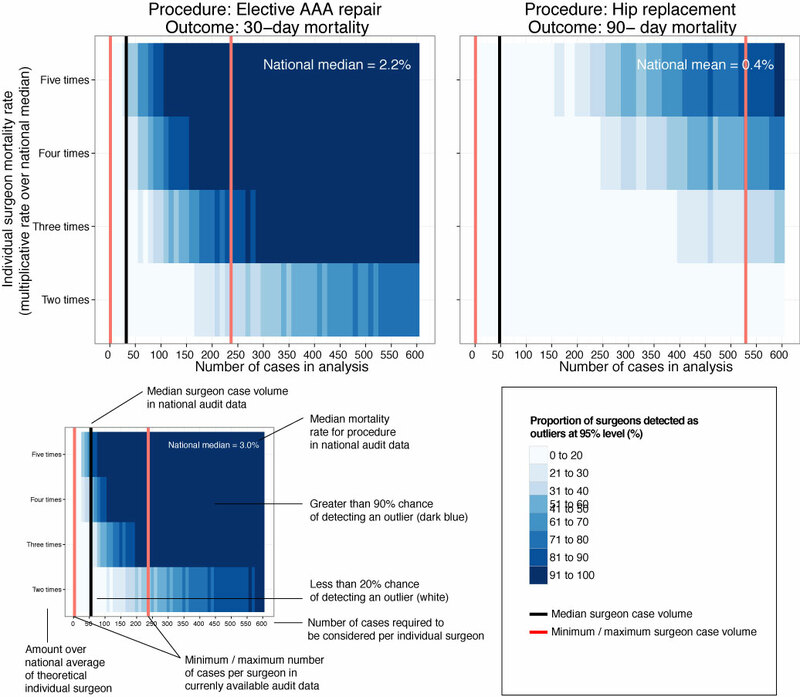 In this issue, Tohme and colleagues present an evaluation of the American College of Surgeons’ National Surgical Quality Improvement Program (ACS-NSQIP) database. Of around 13000 patients who underwent elective liver resection from 2005 to 2012, one third were anaemic prior to surgery. After adjustment, anaemia was associated with major complications after surgery (OR 1.21, 1.09-1.33) but not death. Patients who are anaemic have different characteristics to those who are not, characteristics that are likely to make them more susceptible to complications. While this analysis extensively adjusts for observed factors, residual confounding almost certainly exists. The question remains, does anaemia itself contribute to the occurrence of complications, or is it just a symptom of greater troubles? The authors rightly highlight the importance of identifying anaemia prior to surgery, but it remains to be seen whether treatment is possible and whether it will result in better patient outcomes. Perioperative transfusion is independently associated with major complications. 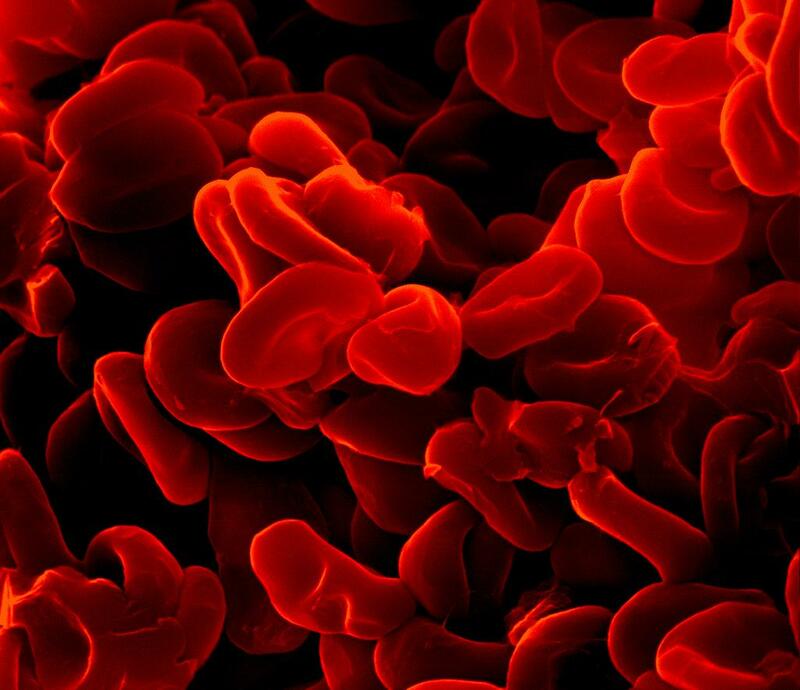 Although there is no additive effect in anaemic patients, the benefits of treating anaemia may be offset by the detrimental effect of transfusion. For those with iron deficiency, treatment with intravenous iron may be of use and is currently being studied in an RCT of all major surgery (preventt.lshtm.ac.uk). Results of studies such as these will help determine causal relationships and whether intervention is possible and beneficial. Keyhole or open surgery for bowel cancer metastases in the liver? Laparoscopic (keyhole) approaches for liver resection are well described and in common use, but we do not yet have robust randomised controlled trial data comparing safety and effectiveness (a number of randomised trials are on-going). Observational studies have been published suggesting approaches are comparable, but as always with studies of this type, bias in treatment allocation limits conclusions. In the February 2016 issue of HPB, Lewin and colleagues present a retrospective observational study comparing survival in laparoscopic versus open resection for colorectal liver metastases. Selection bias always exists in non-randomised studies, but the authors have tried to reduce this with a propensity score based technique. These approaches aim to reduce the bias between treatment groups by accounting for differences in measured variables. Unmeasured variables are clearly not accounted for, while in an RCT these would be expected to be distributed equally between groups. The authors use an “inverse probability of treatment weighting” method, which creates a synthetic sample in which treatment assignment is independent of measured baseline variables. It has the advantage of handling censored survival data better than alternatives and produces estimates of average treatment effects for the entire population, rather than just the treated group. The actual 5 year overall survival of 59% is impressive and the analysis showed equivalent outcomes between open and laparoscopic groups. Residual confounding is likely to exist and as the authors point out, the open group had twice the positive margin rate (18% vs 8%) suggesting these procedures were technically more challenging. We look forward to seeing how these results compare to the outcomes of on-going RCTs. 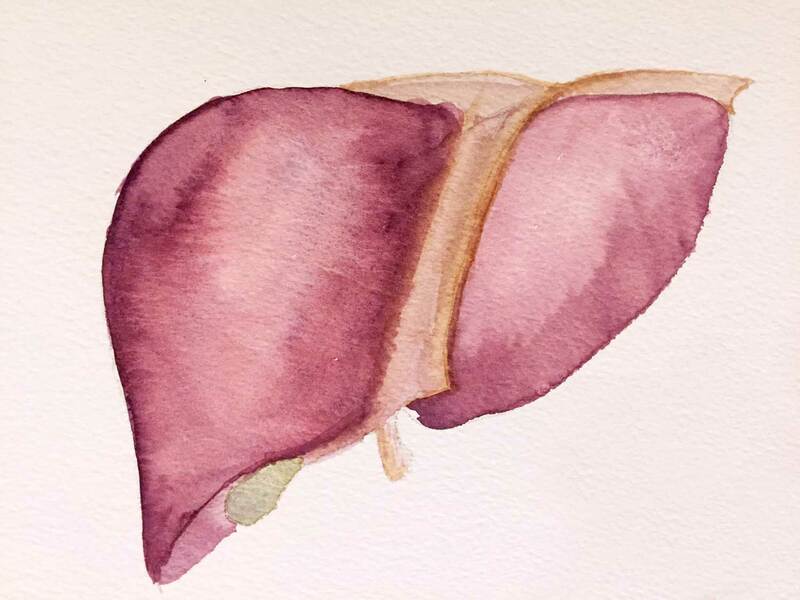 There have been many attempts to define predictive models for the identification of patients at risk of liver failure after surgery (posthepatectomy liver failure (PHLF)) and death. These have previously been hindered by the lack of a robust definition of PHLF and the two most commonly used definitions – the 50-50 and International Study Group of Liver Surgery (ISGLS) criteria – have now helped with this. These definitions are based on a measure of blood clotting (prothrombin time) and the serum bilirubin concentration, reflecting the synthetic and excretory/detoxifying functions of the liver. One criticism of these is that the criteria are taken on day 5 after surgery, a time-point some have argued is too late to intervene upon. 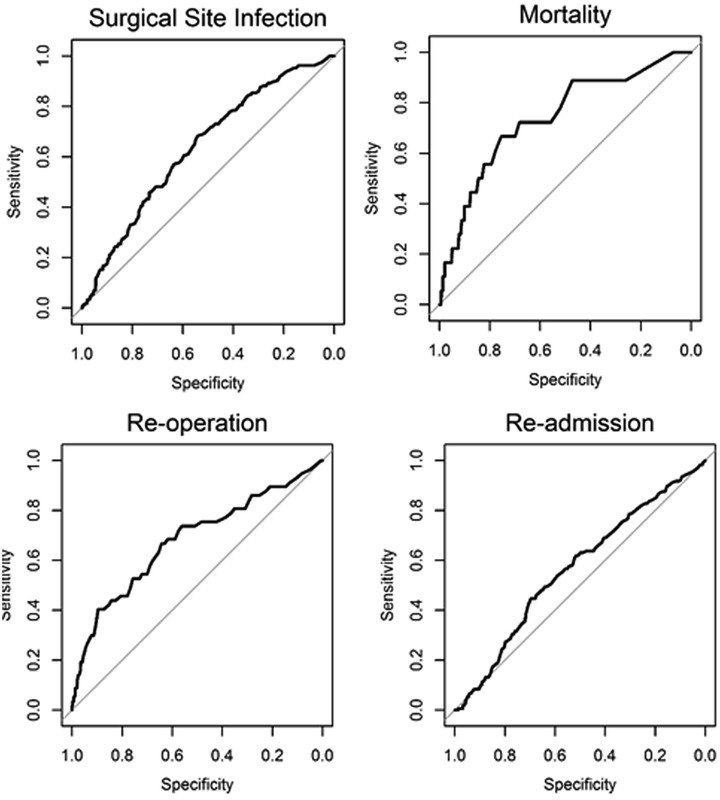 In a new analysis, Herbert and colleagues present an analysis of 1528 major liver resection patients and examine the changes in serum phosphate levels and creatinine immediate after surgery. It was previously shown a failure of phosphate levels to fall after surgery is associated with liver failure and death (Squires, HPB, 2014). Low serum phosphate after liver resection is well recognised and originally thought to be a consequence of consumption during liver growth (hypertrophy). However, while active take-up of phosphate into the liver after surgery does happen, this is insufficient to fully explain low phosphate levels. The authors point to studies demonstrating a significant increase in the urinary excretion of phosphate following hepatectomy which may also contribute. Herbert provides a practical definition: creatinine on day 1 post surgery (PoD1) > day of surgery (DoS) and phosphate fails to decrease by 20% from DoS to PoD1. There is a strong association in multivariable analyses with death (Odds ratio 2.53, 1.36–4.71) and PHLF (3.89, 1.85–8.37). The serum phosphate/creatinine definition identified 52% of those that died, but also 25% that survived without evidence of PHLF. It may be that this can be improved by incorporating other parameters, or my identifying a high risk group a priori. Given the lack of specific therapies beyond that of high quality intensive care, whether death can actually be averted is separate question. ProPublica, an independent investigative journalism organisation, have published surgeon-level complications rates based on Medicare data. I have already highlighted problems with the reporting of the data: surgeons are described as having a “high adjusted rate of complications” if they fall in the red-zone, despite there being too little data to say whether this has happened by chance. This surgeon should not be identified as having a “high adjusted rate of complications” as there are too few cases to estimate the complication rate accurately. I say again, I fully support transparency and public access to healthcare. But the ProPublica reporting has been quite shocking. I’m not aware of them publishing the number of surgeons out of the 17000 that are statistically different to the average. This is a small handful. ProPublica could have chosen a different approach. This is a funnel plot and I’ve written about them before. A funnel plot is a summary of an estimate (such as complication rate) against a measure of the precision of that estimate. In the context of healthcare, a centre or individual outcome is often plotted against patient volume. A horizontal line parallel to the x-axis represents the outcome for the entire population and outcomes for individual surgeons are displayed as points around this. This allows a comparison of individuals with that of the population average, while accounting for the increasing certainty surrounding that outcome as the sample size increases. Limits can be determined, beyond which the chances of getting an individual outcome are low if that individual were really part of the whole population. In other words, a surgeon above the line has a complication rate different to the average. I’ve scraped the ProPublica data for gallbladder removal (laparoscopic cholecystectomy) from California, New York and Texas for surgeons highlighted in the red-zone. These are surgeons ProPublica says have high complication rates. 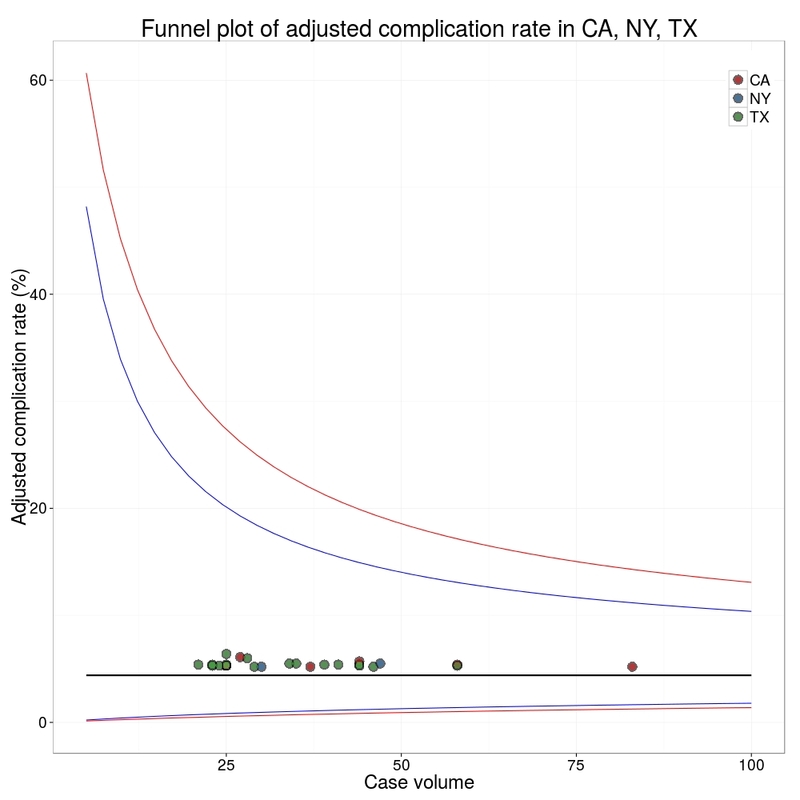 As can be seen from the funnel plot, these surgeons are no where near being outliers. There is insufficient information to say whether any of them are different to average. ProPublica decided to ignore the imprecision with which the complication rates are determined. For red-zone surgeons from these 3 states, none of them have complication rates different to average. Black line, population average (4.4%), blue line 95% control limit, red line 99% control limit. How likely is it that a surgeon with an average complication rate (4.4%) will appear in the red-zone just by chance (>5.2%)? The answer is, pretty likely given the small numbers of cases here: anything up to a 25% chance depending on the number of cases performed. Even at the top of the green-zone (low ACR, 3.9%), there is still around a 1 in 6 chance a surgeon will appear to have a high complication rate just by chance. ProPublica have failed in their duty to explain these data in a way that can be understood. The surgeon score card should be revised. All “warning explanation points” should be removed for those other than the truly outlying cases. # Surgeons with "high adjusted rate of complications"
# At 4.4%, what are the changes of being 5.2% by chance? ProPublica is an organisation performing independent, non-profit investigative journalism in the public interest. Yesterday it published an analysis of surgeon-level complications rates based on Medicare data. Publication of individual surgeons results is well established in the UK. Transparent, easily accessible healthcare data is essential and initiatives like this are welcomed. 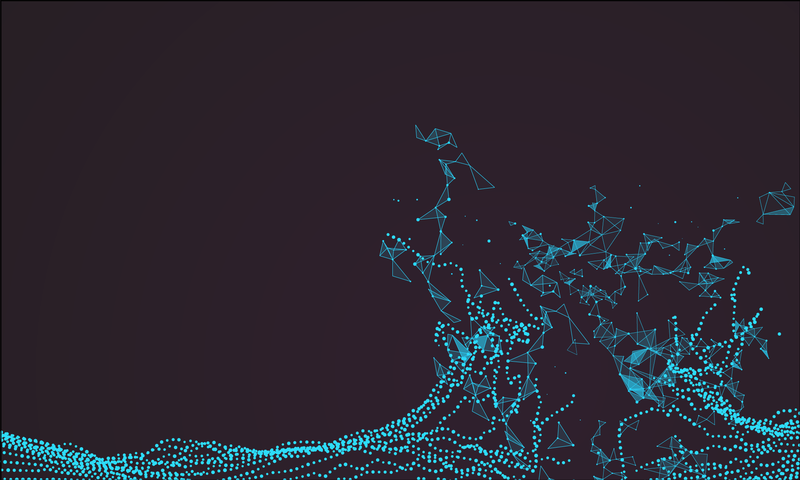 It is important that data are presented in a way that can be clearly understood. Communicating risk is notoriously difficult. This is particularly difficult when it is necessary to describe the precision with which a risk has been estimated. Unfortunately that is where ProPublica have got it all wrong. There is an inherent difficulty faced when we dealing with individual surgeon data. In order to be sure that a surgeon has a complication rate higher than average, that surgeon needs to have performed a certain number of that particular procedure. If data are only available on a small number of cases, we can’t be certain whether the surgeon’s complication rate is truly high, or just appears to be high by chance. If you tossed a coin 10 times and it came up with 7 heads, could you say whether the coin was fair or biased? With only 10 tosses we don’t know. Similarly, if a surgeon performs 10 operations and has 1 complication, can we sure that their true complication rate is 10%, rather than 5% or 20%? With only 10 operations we don’t know. The presentation of the ProPublica data is really concerning. Here’s why. For a given hospital, data are presented for individual surgeons. Bands are provided which define “low”, “medium” and “high” adjusted complication rates. 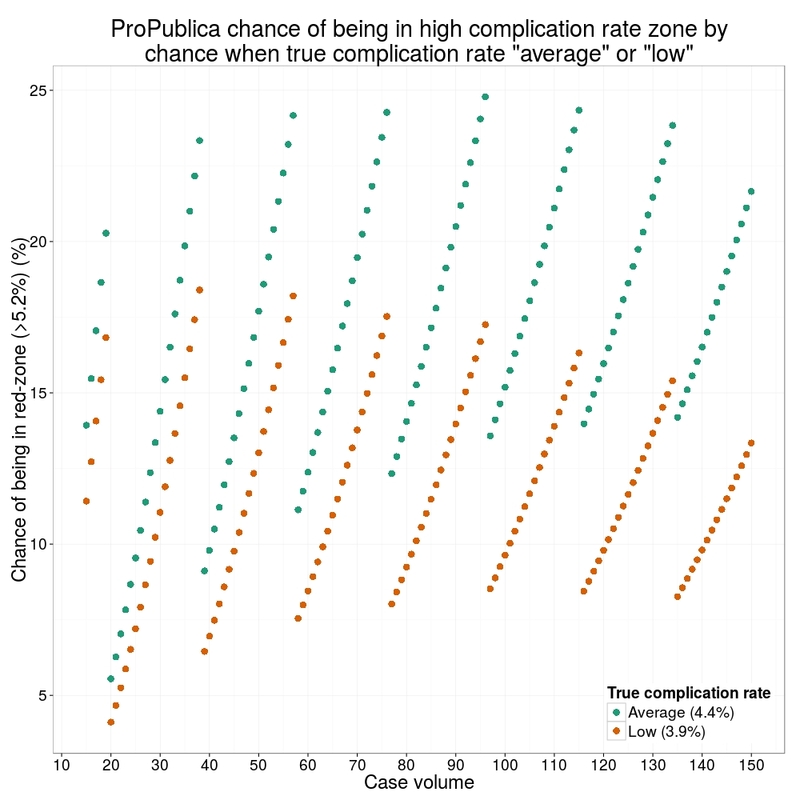 If the adjusted complication rate for an individual surgeon falls within the red-zone, they are described as having a “high adjusted rate of complications”. How confident can we be that a surgeon in the red-zone truly has a high complication rate? To get a handle on this, we need to turn to an off-putting statistical concept called a “confidence interval”. As it’s name implies, a confidence interval tells us what degree of confidence we can treat the estimated complication rate. If the surgeon has done many procedures, the confidence interval will be narrow. If we only have data on a few procedures, the confidence interval will be wide. To be confident that a surgeon has a high complication rate, the 95% confidence interval needs to entirely lie in the red-zone. A surgeon should be highlighted as having a high complication rate if and only if the confidence interval lies entirely in the red-zone. Here is an example. This surgeon performs the procedure to remove the gallbladder (cholecystectomy). There are data on 20 procedures for this individual surgeon. The estimated complication rate is 4.7%. But the 95% confidence interval goes from the green-zone all the way to the red-zone. Due to the small number of procedures, all we can conclude is that this surgeon has either a low, medium, or high adjusted complication rate. Not very useful. Adjusted complication rate: 1.5% on 339 procedures. Surgeon has low or medium complication rate. They are unlikely to have a high complication rate. Adjusted complication rate: 4.0% on 30 procedures. Surgeon has low or medium or high complication rate. Note due to the low numbers of cases, the analysis correctly suggests an estimated complication rate, despite the fact this surgeon has not had any complications for the 30 procedures. Adjusted complication rate: 5.4% on 21 procedures. ProPublica conclusion: surgeon has high adjusted complication rate. Actual conclusion: surgeon has low, medium or high complication rate. Adjusted complication rate: 6.6% on 22 procedures. ProPublica conclusion: surgeon has high adjusted complication rate. Actual conclusion: surgeon has medium or high complication rate, but is unlikely to have a low complication rate. Adjusted complication rate: 7.6% on 86 procedures. ProPublica conclusion: surgeon has high adjusted complication rate. Actual conclusion: surgeon has high complication rate. This is one of the few examples in the dataset, where the analysis suggest this surgeon does have a high likelihood of having a high complication rate. In the UK, only this last example would to highlighted as concerning. That is because we have no idea whether surgeons who happen to fall into the red-zone are truly different to average. The analysis above does not deal with issues others have highlighted: that this is Medicare data only, that important data may be missing , that the adjustment for patient case mix may be inadequate, and that the complications rates seem different to what would be expected. ProPublica have not moderated the language used in reporting these data. My view is that the data are being misrepresented. ProPublica should highlight cases like the last mentioned above. For all the others, all that can be concluded is that there are too few cases to be able to make a judgement on whether the surgeon’s complication rate is different to average. The GlobalSurg project is continuing to be a great experience. The first cohort study reports data from patients undergoing emergency abdominal surgery across the world. 10,745 patients from 357 centres across 58 countries. Around half are from high (n=6538, 60.8%) and half from low/middle (n=4207, 39.2%) human development index (HDI) settings. We are limited in what findings we can release prior to formal publication. But here are some of the areas we have looked at. Trauma is the indication for surgery in a higher proportion of cases in middle and low HDI countries (10.0% and 12.1% respectively) than in HDI countries (2.2%). Use of midline laparotomy increased across development indices (high 27.3%, middle 29.0%, low 41.4%).